It is the largest village in Tinos, after Chora. Most visitors distinguish it from other villages and regard it not just very beautiful, but an outdoor museum of folk art as well, which preserves the traditional Cycladic architecture. It has many gorgeous creations made of marble and gives the feeling of elegance, artistry and human inspiration. While strolling through the picturesque streets you can admire the marble decorations around the windows, the lintels with a variety of decorative motifs, the fountains and the School of Fine Arts, from which famous Greek sculptors graduated. 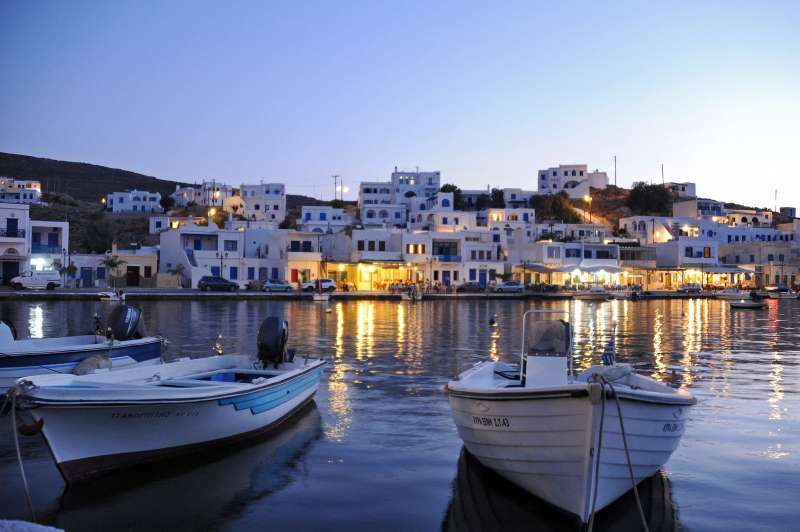 “It is the most beautiful village of the island and one of the most beautiful of the Cyclades”. Don’t forget to visit Giannoulis Chalepas’s house – museum, the cemetery with the marble masterpieces and the museum of Tinian Artists exhibiting works by Giannoulis Chalepas, Filippotis, Sochos, Vitalis etc. Before leaving take a rest in the village square, where you can enjoy a “greek coffee” on the coals and a traditional desert like “galaktompoureko”, under the magnificent plane trees. is a beautiful fishing village on the north of the island which has a picturesque natural port and fish restaurants by the sea. It is the haven of Pyrgos and one of the most beautiful destinations in Tinos. This coastal settlement used to be one of the two major ports of the island, a transshipment center in the past century. Dozens of small boats arriving used to transfer goods from Exo Meria to Panormos and wheat from Greece and abroad, necessary for the windmills to grind. Nowadays, the port can accommodate small fishing and tourist boats. You can swim in the nearby clean sandy beaches (Aghia Thalassa, Kavalourko, Rochari) and enjoy a delicious meal with fresh fish at the taverns, while looking at Planitis with its ruined lighthouse. Just three kilometers from the town of Tinos, Kionia, on a beautiful promenade, are the archaeological site of the ancient temple dedicated to Poseidon and his wife Amphitrite. Tradition has it that in ancient times, Tinos was full of snakes, so called Ofiousa. Of those relieved Poseidon, the ancient Tinian built, thanking, this temple dedicated to the god of the sea. Situated next to the archaeological site is the modern resort of Kionia, with many taverns, hotel Tinos Beach and quite accommodation for rent next door and behind it. In summer there is transportation to and from the city about every hour. The beach is long (extending more than a kilometer) and just off the road is paved.